Keep your pet smelling great while promoting a healthy coat and healthy skin with the Top Performance Fresh Pet Shampoo. The composition of the Top Performance shampoo yields a formula that helps prevent tangles and mats in the dog or cat’s fur, ensuring an easy comb out after the bath. 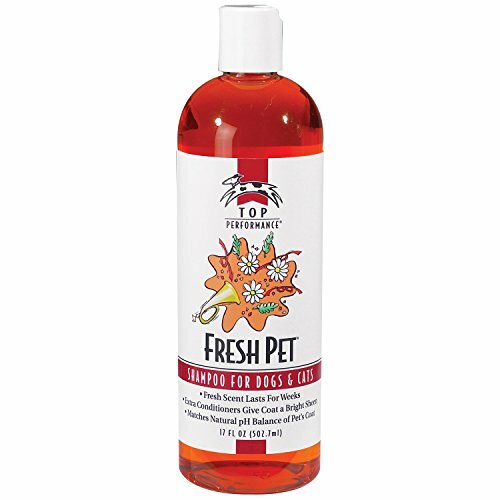 The Fresh Pet Shampoo includes a pleasing scent that lasts for weeks after the bath, while matching the natural pH balance of the coat and skin of the pets. The shampoo is safe to use for puppies and kittens as young as 6 weeks of age.